This article is about the Mesopotamian deities. For the role-playing game character, see Demon: The Fallen. The Anunnaki (also transcribed as Anunaki, Anunna, Ananaki, and other variations) are a group of deities that appear in the mythological traditions of the ancient Sumerians, Akkadians, Assyrians, and Babylonians. Descriptions of how many Anunnaki there were and what role they fulfilled are inconsistent and often contradictory. In the earliest Sumerian writings about them, which come from the Post-Akkadian period, the Anunnaki are the most powerful deities in the pantheon, descendants of An, the god of the heavens, and their primary function is to decree the fates of humanity. The name Anunnaki is derived from An, the Sumerian god of the sky. The name is variously written "da-nuna", "da-nuna-ke4-ne", or "da-nun-na", meaning "princely offspring" or "offspring of An". The Anunnaki were believed to be the offspring of An and his consort, the earth goddess Ki. Samuel Noah Kramer identifies Ki with the Sumerian mother goddess Ninhursag, stating that they were originally the same figure. The oldest of the Anunnaki was Enlil, the god of air and chief god of the Sumerian pantheon. The Sumerians believed that, until Enlil was born, heaven and earth were inseparable. Then, Enlil cleaved heaven and earth in two and carried away the earth while his father An carried away the sky. 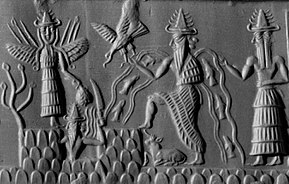 The Anunnaki are chiefly mentioned in literary texts and very little evidence to support the existence of any cult of them has yet been unearthed. This is likely due to the fact that each member of the Anunnaki had his or her own individual cult, separate from the others. Similarly, no representations of the Anunnaki as a group have yet been discovered, although a few depictions of its individual members have been identified. Deities in ancient Mesopotamia were almost exclusively anthropomorphic. They were thought to possess extraordinary powers and were often envisioned as being of tremendous physical size. The deities typically wore melam, an ambiguous substance which "covered them in terrifying splendor". Melam could also be worn by heroes, kings, giants, and even demons. The effect that seeing a deity's melam has on a human is described as ni, a word for the physical tingling of the flesh. Deities were almost always depicted wearing horned caps, consisting of up to seven superimposed pairs of ox-horns. They were also sometimes depicted wearing clothes with elaborate decorative gold and silver ornaments sewn into them. The ancient Mesopotamians believed that their deities lived in Heaven, but that a god's statue was a physical embodiment of the god himself. As such, cult statues were given constant care and attention and a set of priests were assigned to tend to them. These priests would clothe the statues and place feasts before them so they could "eat". A deity's temple was believed to be that deity's literal place of residence. The gods had boats, full-sized barges which were normally stored inside their temples and were used to transport their cult statues along waterways during various religious festivals. The gods also had chariots, which were used for transporting their cult statues by land. Sometimes a deity's cult statue would be transported to the location of a battle so that the deity could watch the battle unfold. The major deities of the Mesopotamian pantheon, which included the Anunnaki, were believed to participate in the "assembly of the gods", through which the gods made all of their decisions. This assembly was seen as a divine counterpart to the semi-democratic legislative system that existed during the Third Dynasty of Ur (c. 2112 BC — c. 2004 BC). The earliest known usages of the term Anunnaki come from inscriptions written during the reign of Gudea (c. 2144 — 2124 BC) and the Third Dynasty of Ur. In the earliest texts, the term is applied to the most powerful and important deities in the Sumerian pantheon: the descendants of the sky-god An. This group of deities probably included the "seven gods who decree": An, Enlil, Enki, Ninhursag, Nanna, Utu, and Inanna. Although certain deities are described as members of the Anunnaki, no complete list of the names of all the Anunnaki has survived and they are usually only referred to as a cohesive group in literary texts. Furthermore, Sumerian texts describe the Anunnaki inconsistently and do not agree on how many Anunnaki there were, or what their divine function was. Originally, the Anunnaki appear to have been heavenly deities with immense powers. In the poem Enki and the World Order, the Anunnaki "do homage" to Enki, sing hymns of praise in his honor, and "take up their dwellings" among the people of Sumer. The same composition repeatedly states that the Anunnaki "decree the fates of mankind". Virtually every major deity in the Sumerian pantheon was regarded as the patron of a specific city and was expected to protect that city's interests. The deity was believed to permanently reside within that city's temple. One text mentions as many as fifty Anunnaki associated with the city of Eridu. In Inanna's Descent into the Netherworld, there are only seven Anunnaki, who reside within the Underworld and serve as judges. Inanna stands trial before them for her attempt to take over the Underworld; they deem her guilty of hubris and condemn her to death. Major deities in Sumerian mythology were associated with specific celestial bodies. Inanna was believed to be the planet Venus. Utu was believed to be the sun. Nanna was the moon. An was identified with all the stars of the equatorial sky, Enlil with those of the northern sky, and Enki with those of the southern sky. The path of Enlil's celestial orbit was a continuous, symmetrical circle around the north celestial pole, but those of An and Enki were believed to intersect at various points. Akkadian texts of the second millennium BC follow similar portrayals of the Anunnaki from Inanna's Descent into the Netherworld, depicting them as chthonic Underworld deities. In an abbreviated Akkadian version of Inanna's Descent written in the early second millennium, Ereshkigal, the queen of the Underworld, comments that she "drink[s] water with the Anunnaki". Later in the same poem, Ereshkigal orders her servant Namtar to fetch the Anunnaki from Egalgina, to "decorate the threshold steps with coral", and to "seat them on golden thrones". During the Old Babylonian Period (c. 1830 BC — c. 1531 BC), a new set of deities known as the Igigi are introduced. The relationship between the Anunnaki and the Igigi is unclear. On some occasions, the categories appear to be used synonymously, but in other writings, such as The Poem of Erra, there is a clear distinction between the two. In the late Akkadian Atra-Hasis epic, the Igigi are the sixth generation of the gods who are forced to perform labor for the Anunnaki. After forty days, the Igigi rebel and the god Enki, one of the Anunnaki, creates humans to replace them. From the Middle Babylonian Period (c. 1592 — 1155 BC) onward, the name Anunnaki was applied generally to the deities of the underworld; whereas the name Igigi was applied to the heavenly deities. During this period, the underworld deities Damkina, Nergal, and Madānu are listed as the most powerful among the Anunnaki, alongside Marduk, the national god of ancient Babylon. In the standard Akkadian Epic of Gilgamesh (c. 1200 BC) Utnapishtim, the immortal survivor of the Great Flood, describes the Anunnaki as seven judges of the Underworld, who set the land aflame as the storm approaches. Later, when the flood comes, Ishtar (the East Semitic equivalent to Inanna) and the Anunnaki mourn over the destruction of humanity. In the Babylonian Enûma Eliš, Marduk assigns the Anunnaki their positions. A late Babylonian version of the epic mentions 600 Anunnaki of the underworld, but only 300 Anunnaki of heaven, indicating the existence of a complex underworld cosmology. In gratitude, the Anunnaki, the "Great Gods", build Esagila, a "splendid" temple dedicated to Marduk, Ea, and Ellil. 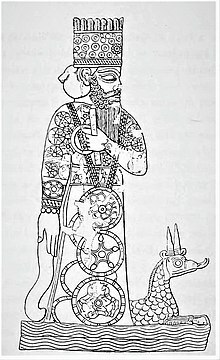 In the eighth-century BC Poem of Erra, the Anunnaki are described as the brothers of the god Nergal and are depicted as antagonistic towards humanity. 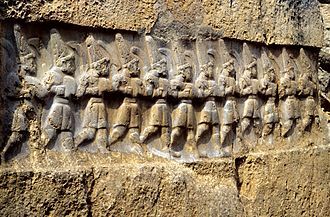 A badly damaged text from the Neo-Assyrian Period (911 — 612 BC) describes Marduk leading his army of Anunnaki into the sacred city of Nippur and causing a disturbance. The disturbance causes a flood, which forces the resident gods of Nippur to take shelter in the Eshumesha temple to Ninurta. Enlil is enraged at Marduk's transgression and orders the gods of Eshumesha to take Marduk and the other Anunnaki as prisoners. The Anunnaki are captured, but Marduk appoints his front-runner Mushteshirhablim to lead a revolt against the gods of Eshumesha and sends his messenger Neretagmil to alert Nabu, the god of literacy. When the Eshumesha gods hear Nabu speak, they come out of their temple to search for him. Marduk defeats the Eshumesha gods and takes 360 of them as prisoners of war, including Enlil himself. Enlil protests that the Eshumesha gods are innocent, so Marduk puts them on trial before the Anunnaki. The text ends with a warning from Damkianna (another name for Ninhursag) to the gods and to humanity, pleading them not to repeat the war between the Anunnaki and the gods of Eshumesha. In the mythologies of the Hurrians and Hittites (which flourished in the mid to late second millennium BC), the oldest generation of gods was believed to have been banished by the younger gods to the Underworld, where they were ruled by the goddess Lelwani. Hittite scribes identified these deities with the Anunnaki. 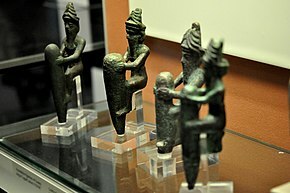 In ancient Hurrian, the Anunnaki are referred to as karuileš šiuneš, which means "former ancient gods", or kattereš šiuneš, which means "gods of the earth". Hittite and Hurrian treaties were often sworn by the old gods in order to ensure that the oaths would be kept. In one myth, the gods are threatened by the stone giant Ullikummi, so Ea (the later name for Enki) commands the Former Gods to find the weapon that was used to separate the heavens from the earth. They find it and use it to cut off Ullikummi's feet. Although the names of the Anunnaki in Hurrian and Hittite texts frequently vary, they are always eight in number. In one Hittite ritual, the names of the old gods are listed as: "Aduntarri the diviner, Zulki the dream interpress, Irpitia Lord of the Earth, Narā, Namšarā, Minki, Amunki, and Āpi." The old gods had no identifiable cult in the Hurrio-Hittite religion; instead, the Hurrians and Hittites sought to communicate with the old gods through the ritual sacrifice of a piglet in a pit dug in the ground. The old gods were often invoked to perform ritual purifications. The Hittite account of the old gods' banishment to the Underworld ultimately became the source for the Greek poet Hesiod's narrative of the overthrow of the Titans by the Olympians in his Theogony. The Greek sky-god Ouranos (whose name means "Heaven") is the father of the Titans and is derived from the Hittite version of Anu. In Hesiod's account, Ouranos is castrated by his son Kronos, just as Anu was castrated by his son Kumarbi in the Hittite story. In his 1976 book The Twelfth Planet, Russian-American author Zecharia Sitchin claimed that the Anunnaki were actually a race of extraterrestrial beings from the undiscovered planet Nibiru, who came to Earth around 500,000 years ago in order to mine gold. According to Sitchin, the Anunnaki genetically engineered homo erectus to create modern humans to work as their slaves. Sitchin claimed that the Anunnaki were forced to leave Earth when Antarctic glaciers melted, causing the Flood of Noah, which also destroyed the Anunnaki's bases on Earth. These had to be rebuilt and the Nephilim, needing more humans to help in this massive effort, taught them agriculture. Ronald H. Fritze writes that, according to Sitchin, "the Annunaki built the pyramids and all the other monumental structures from around the world that ancient astronaut theorists consider so impossible to build without highly advanced technologies." Sitchin also claimed that the Anunnaki had left behind human-alien hybrids, some of whom may still be alive today, unaware of their alien ancestry. Sitchin expanded on this mythology in later works, including The Stairway to Heaven (1980) and The Wars of Gods and Men (1985). In The End of Days: Armageddon and the Prophecy of the Return (2007), Sitchin predicted that the Anunnaki would return to earth, possibly as soon as 2012, corresponding to the end of the Mesoamerican Long Count calendar. Sitchin's writings have been universally rejected by mainstream historians, who have labelled his books as pseudohistory, pointing out that Sitchin seemingly deliberately misrepresents Sumerian texts by quoting them out of context, truncating quotations, and mistranslating Sumerian words to give them radically different meanings from their accepted definitions. Nonetheless, because Sitchin worked in the shadow of Erich von Däniken's more widely publicized Chariots of the Gods?, he managed to escape the notice of debunkers, allowing his theories to become more influential. Although Sitchin himself described the Anunnaki as humanoids, in a book published in 1994, the conspiracy theorist Arthur Horn proposed that they were actually reptilians. British conspiracy theorist David Icke further expanded on this thesis by claiming that the surviving alien bloodlines mentioned by Sitchin were the "Brotherhood of Babylon", a race of shape-shifting, reptilian aliens who secretly control all the governments of the world and keep humans enslaved, using the Illuminati as one of their figurative chess pieces. ^ a b c d e Black & Green 1992, p. 98. ^ a b c Nemet-Nejat 1998, p. 185. ^ a b c d e f g h i j k l Black & Green 1992, p. 34. ^ a b Leemings 2009, p. 21. ^ Kramer 1961, p. 41. ^ Kramer 1963, p. 122. ^ Coleman & Davidson 2015, p. 108. ^ Kramer 1983, pp. 115–121. ^ a b Kramer 1961, pp. 72–73. ^ a b Kramer 1961, pp. 72–75. ^ a b c d e f g h i j k l m n o Leick 1998, p. 8. ^ Falkenstein 1965, pp. 127–140. ^ a b c d e f g h i j k l Brisch 2016. ^ a b c Black & Green 1992, p. 93. ^ Black & Green 1992, pp. 93–94. ^ Black & Green 1992, pp. 130–131. ^ Black & Green 1992, p. 130. ^ Black & Green 1992, p. 102. ^ a b c d Black & Green 1992, p. 94. ^ a b Nemet-Nejat 1998, p. 186. ^ a b Nemet-Nejat 1998, pp. 186–187. ^ Nemet-Nejat 1998, pp. 186–188. ^ Black & Green 1992, p. 174. ^ a b Black & Green 1992, pp. 44–45. ^ a b Black & Green 1992, p. 52. ^ Kramer 1961, pp. 32–33. ^ Katz 2003, p. 403. ^ Kramer 1963, p. 123. ^ Kramer 1963, pp. 122–123. ^ Kramer 1963, p. 180. ^ a b Nemet-Nejat 1998, p. 179. ^ Nemet-Nejat 1998, p. 187-189. ^ Edzard 1965, pp. 17–140. ^ a b c Wolkstein & Kramer 1983, p. 60. ^ Nemet-Nejat 1998, pp. 201–203. ^ Black & Green 1992, pp. 108–109. ^ a b c Nemet-Nejat 1998, p. 203. ^ Black & Green 1992, pp. 182–184. ^ Black & Green 1992, p. 135. ^ Rogers 1998, p. 13. ^ Levenda 2008, p. 29. ^ Levenda 2008, pp. 29–30. ^ Leick 2003, p. 100. ^ Willis 2012, p. 62. ^ a b c Oshima 2010, pp. 145–146. ^ Dalley 1989, p. 156. ^ a b c Dalley 1989, p. 159. ^ Black & Green 1992, p. 106. ^ a b Leick 1998, p. 85. ^ a b Leick 2003, p. 96. ^ Dalley 1989, pp. 112. ^ Dalley 1989, p. 113. ^ Pritchard 2010, pp. 33–34. ^ Pritchard 2010, p. 34-35. ^ a b c d e Oshima 2010, p. 145. ^ a b c d e Oshima 2010, p. 146. ^ Collins 2002, p. 228. ^ a b c d e Leick 1998, p. 141. ^ a b c d e f Collins 2002, p. 225. ^ a b Van Scott 1998, p. 187. ^ a b c Archi 1990, p. 114. ^ Puhvel 1987, pp. 25–26. ^ a b Puhvel 1987, p. 26. ^ Collins 2002, pp. 225–226. ^ Collins 2002, pp. 226–227. ^ Puhvel 1987, pp. 26–27. ^ Puhvel 1987, pp. 27–29. ^ Puhvel 1987, pp. 29–30. ^ Puhvel 1987, pp. 27–30. ^ Puhvel 1987, pp. 25–26, 29–30. ^ a b c d Fritze 2016, p. 292. ^ a b c d Fritze 2009, p. 212. ^ a b c d e f g h i Robertson 2016. ^ a b c Fritze 2009, pp. 212–213. ^ a b Fritze 2009, p. 213. ^ Fritze 2009, pp. 213–214. ^ Fritze 2009, p. 214. ^ Robertson 2016, p. 94.